It's time for Copacabana vibes! Bright and hot Genesis in fuchsia shades. BABE is our Bath & Beach collection of wraps with chenille yarn which resembles the look and feel of a classic bath towel. 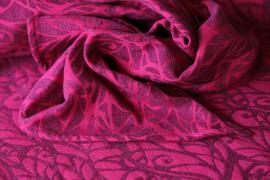 Woven in our signature raspberry weave, the BABE wraps are strong, supportive, with the soft feel of the chenille yarn. They work excellent in one layer as well as multiple layers carries. Suitable from newborn to toddler. Chenille yarn gives a gentle grip which will keep your wrap job in place for many hours. 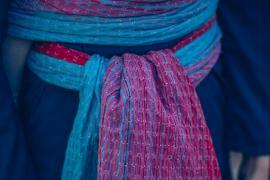 Solnce ring slings are crafted with gathered shoulder. The color of the rings is optional depending on the availability. 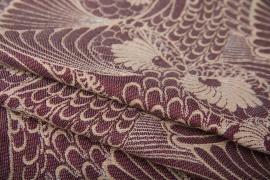 KALIOPE is our next, new, not geometric pattern in beautiful pink color of tussah silk with nubs on silver-grey cotton. KALIOPE PINK DURANGO need to be wash before use. The colors of summer sunset with turquoise blue. Cotton bouclé yarn gives an outstanding texture to the pattern. The wrap is very floppy and will break in with a moderate effort. It does not feel too thick in hands despite the voluminous visual effect. This wrap will hold your wrap job in place for hours. It is suitable for a bit older babies and toddlers. Last Giulia is here! We love this rainbow so much but this is the last model we have in offer. This rainbow is very spring and sunny! 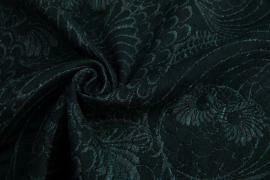 Wrap has nice texture and it is very supportive. Weave makes really nice pattern :) Don't be afraid about high gsm because this wrap is very soft and we are sure you will love it! 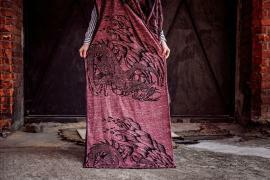 DRAKON is our new not geometric pattern in beautiful red and white color of tussah silk with nubs on black cotton. DRAKON TRIBE need to be wash before use. We can’t wait for Celestial Aura to be released tomorrow on Wednesday 10th April at 10:00am AEST. Just a reminder of the release details. Have you been waiting for Felicia? Those colors are amazing! New weave on board – cloth weave is flat weave mixed with little drops what make wrap very nice and extremly grippy after washing < You can feel this great texture when you touch it. Wrap is very supportive and in makes really nice pattern :) We love thIs rainbow for little bit sweet and little bit cold and little bit warm! 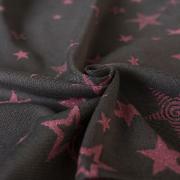 Don't be afraid about high gsm because this wrap is very soft and we are sure you will love it! One lucky GT 20% off owner will be announced tomorrow (saturday) about 11 a.m. CEST. Draw winners will get emails tomorrow - April 6th (Saturday) and we will send a message about 2 p.m. CET that day. Lustrous shine, the feel of silky pearls on the skin, cool to the touch like a class of cold champagne on a hot summer evening, elegant drape and and impossible to resist desire to drape yourself from head to toes in the fabric. It's all about the sugar cane fiber, a new generation of high tech, environmentally friendly fibers. Made from the bagasse, the left overs parts of the sugar cane after the juice has been extracted from the plant. The mesmerizing play of pure white, teal and purple. 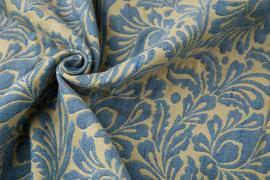 Woven in our signature cloudberry weave, this wrap is soft from the start, airy, but strong and supportive. Suitable for all ages. The wrap may be washed in the machine on gentle setting at 30 degrees Celsius, and a maximum of 600 rotations. 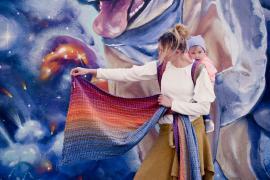 Solnce ring sling are crafted with a gathered shoulder. The color of the rings is optional. Low contrast classy beauty! You will love these nubs, softness, cushiness and support. The color is very tricky, depends on light - darker green or with a light shade of petrol. Linuschka double cushy weave. Perfect toddler wrap. For more correct color shade please check the product pictures. Wenn KOKADI ein Symbol ausmacht, dann ist es unser beliebter Stern – unsere funkelnden Liselotte Stars lassen unseren Design Klassiker in neuem Glanz erstrahlen! Ganz besonders bei diesem KOKADI: Zusätzlich zu 77% handgepflückter Bio Baumwolle und 1% Polyester ist 22% Mikromodal enthalten, was für seine weichen und glänzenden Fasern bekannt ist. Ein praktikables Schmuckstück, mit dem sich selbst größere Babys mühelos tragen lassen! Cushy beauty for wool lovers. Soft, cushy, wooly. Perfect toddler wrap. It needs a short breaking in but will become very prompt soft. Soft spring-summer colors, amazing support and cushiness. Gorgeous linen with colorful confetti stripes combined with soft and strong shimmery mercerized Egyptian long staples cotton in golden sand shade. Pocket weave on ecru warp. It needs just a short breaking in time to become soft and cushy. 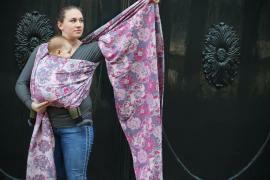 Easy care, non wool, perfect toddler wrap. This wrap has typically for linen irregularities. 70% cotton 30% Repreve , 330 gr/m2 post wash, duo weave. 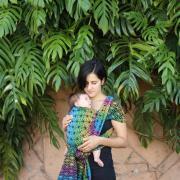 wrap is highly suitable for larger babies and toddlers. € 85 for a size 6.